September not only marks the end of the long cold, but is also a month of celebration for a whole other reason. South Africans celebrate their heritage on the 24th of September 2018, unofficially dubbed Braai Day (time for another #BraaiInTheSky we say) although the whole month is filled with celebrations. Flight prices are slightly elevated on the 21st of September with the public holiday on the 24th of September also causing elevated flight prices. More affordable options are available on mid-week flights on most routes, usually from Mondays to Thursdays. Kulula JNB to Cape Town : Budget conscious travellers should avoid travelling on weekends, particularly the dates highlighted in pink. 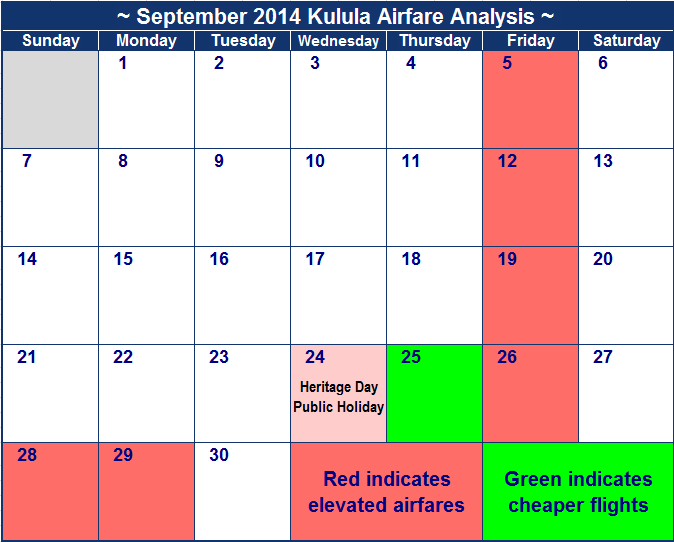 Kulula Cape Town to JNB :: Mid-week flights are the most cost-effective option, as the dates highlighted in green prove. 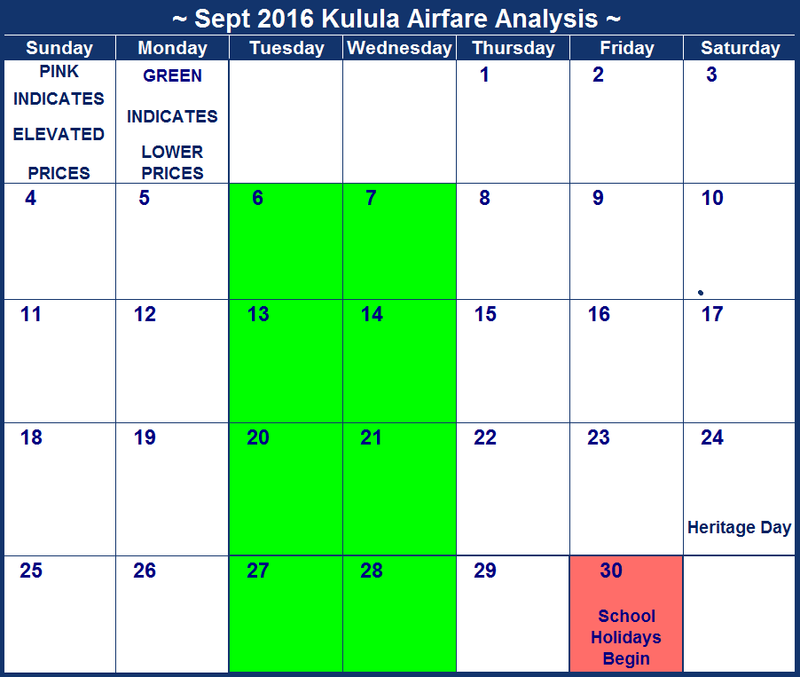 Kulula Lanseria to CPT : Look out for travel dates highlighted in green where possible as those are the most affordable dates to travel on. Kulula CPT to Lanseria : Mondays to Thursdays are the most budget-friendly days of the week to travel on. Kulula JNB to Durban : Flight prices are slightly elevated towards the end of the month and the weekend around the public holiday. Kulula Durban to JNB: Affordable flights are readily available throughout the month. Kulula Lanseria to Durban : Affordable flights are easy to find on this route, just try to avoid weekend travel where possible. Kulula Durban to Lanseria : Budget-conscious travellers are spoilt for choice on this flight route, but should avoid the public holiday where possible. 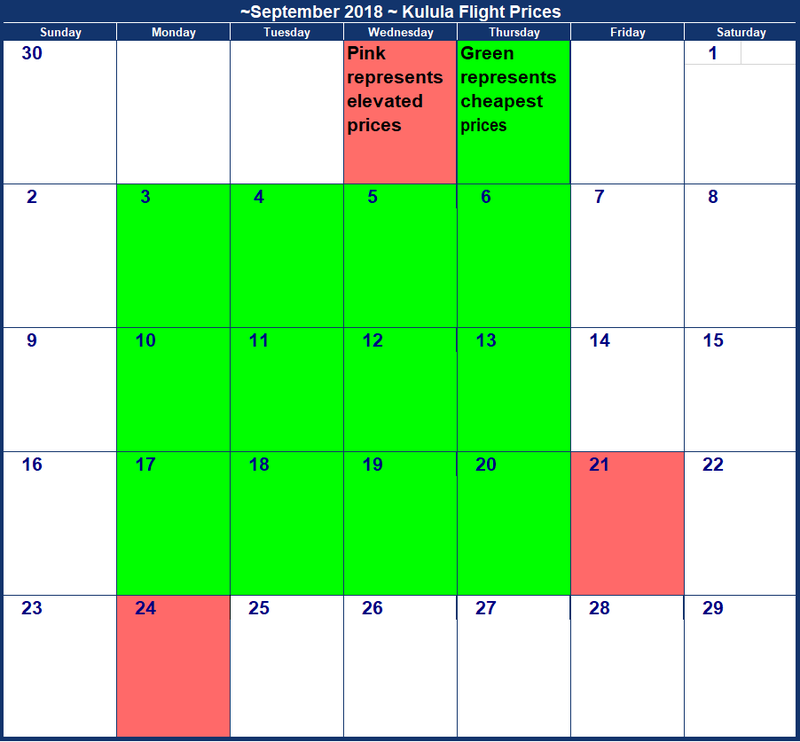 Kulula JHB to George : Avoid travelling on the 20th, 21st or 30th of September where possible as flight prices are incredibly inflated on those dates. Kulula George to JHB : Fridays are the most cost-effective day of the week to travel on this month. Kulula CPT to Durban : Avoid travelling on dates highlighted in pink where possible. Kulula Durban to CPT : Affordable flights are hard to come by on this route, so try to stick to dates highlighted in green if you're on a tight budget. Kulula JHB to East london : Avoid travelling on Fridays where possible as those are the most expensive days to travel on. Kulula East London to JHB : With the exception of the public holidays, affordable flights are readily available between Mondays and Thursdays. Flight prices were surveyed on the 28th of August 2018. It is hard to believe that spring is right around the corner, but with September fast approaching there is no point in putting off making plans. Whatever you do this September, be sure to make some time for a braai or two - the 24th of September is Heritage Day after all! As this falls on a Sunday, the following Monday is a public holiday. Flight prices are slighly elevated around these dates, particularly from the Thursday to the Tuesday. Avoid travelling on these dates where possible. If you are budget conscious, be sure to travel during the first two weeks of the month. See below for the cheapest flights highlighted in green on each route. Kulula JNB to Cape Town : Avoid travelling on the 22nd and the 30th if you are on a budget, as flights are incredibly expensive on those dates. Kulula Cape Town to JNB : Flights are incredibly consistent throughout the month, but won't stay that way for long. Book now before it is too late. Kulula Lanseria to CPT : Mid-week flights are the most affordable, but if you book far enough in advance you'll score cheap flights over the weekends as well. Kulula CPT to Lanseria : Flight prices start out incredibly consistent, but avoid travelling during the last week of the month if possible. Kulula JNB to Durban : Avoid travelling on dates highlighted in pink as those are the most expensive. Kulula Durban to JNB: Flight prices increase the two days before the long weekend, making the latter half of the month more expensive to travel on. Kulula Durban to Lanseria : Prices are incredibly consistent, with the only travel date to avoid being the public holiday. Kulula JHB to George : If possible avoid travelling on the 21st, 22nd, 23rd, 28th, 29th and the 30th as flight prices are slightly elevated on those dates. Kulula George to JHB : Budget conscious travellers can pretty much pick and choose their travel dates this month as prices are so consistant. Kulula CPT to Durban : Mid-week flights are the most budget-consious options available. 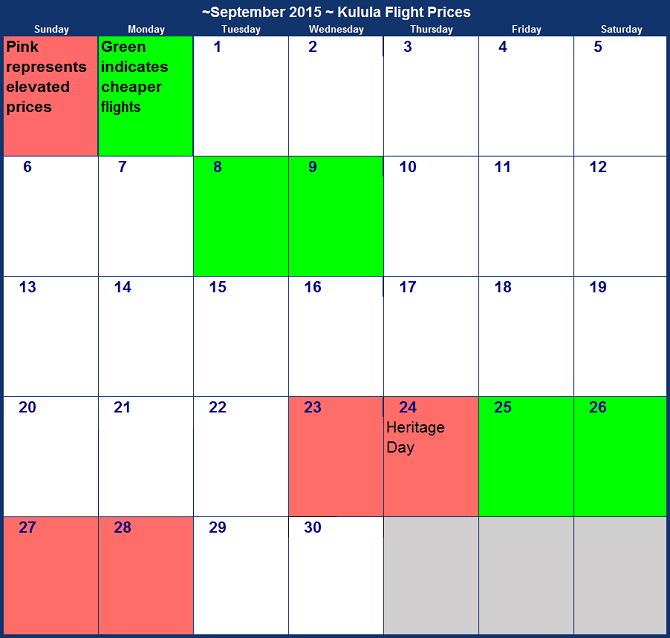 Kulula Durban to CPT : Look out for dates highlighted in green to save on flight prices. Kulula East London to JHB : If possible, avoid travelling on the public holiday. It is usually around September that the year starts to feel like it is dragging on, so luckily spring brings with it a breath of fresh air. In travel terms, spring is also a great time to explore our beautiful country and see the West Coast blooms. If you are travelling, try to avoid the 30th of September 2016 as the school holidays start then. Rather travel a few days before or after to save. The only public holiday in September, Heritage Day, falls on a Saturday so unfortunately there is no long weekend in stall. Don't let that stop you as more affordable airfares might make it worth taking a day's leave! Kulula JNB to Cape Town : Avoid travelling on the 30th if you are on a budget, as flights are incredibly expensive on that date. Kulula Cape Town to JNB : Flights are incredibly consistent throughout the month, but won''t stay that way for long. Book now before it is too late. Kulula CPT to Lanseria : Flight prices are incredibly consistent throughout the month, we doubt it will stay like this for long. Kulula JNB to Durban : You're sure to get a great deal every day of the month with these consistent prices. Kulula Durban to JNB: If possible, avoid travelling on Mondays as those are the most expensive days to travel on. Kulula Lanseria to Durban : Great deals all around - we're sure closer to the time mid-week flights will be cheaper than weekend flights..
Kulula Durban to Lanseria : Great deals all around - we're sure closer to the time mid-week flights will be cheaper than weekend flights..
Kulula JHB to George : Mondays, Tuesdays and Wednesdays are great for budget travellers, who should avoid travelling on the 30th. Kulula George to JHB : If you are on a budget, you might want to avoid travelling on the 11th. Kulula CPT to Durban : Planning a school break? Head out before the holidays start on the 30th to save a few bucks. Kulula Durban to CPT : Tuesday flights are by far the best option for the budget conscious travellers. Kulula East London to JHB : Avoid travelling on the 4th and 30th if you are trying to save costs. September represents spring and warmer weather, making it a favourite amongst South Africans. There is also a public holiday to sweeten the deal. Heritage Day is on the 24th of September 2015, a Thursday. So there is no long weekend, unless you create one for yourself. Flight prices are still elevated around those dates, for the lucky ones that do manage to have an extended break. So try to avoid travelling between the 23rd and 28th of September 2015. Rather travel on the 8th or the 9th of September to get affordable flights. Flight prices below were surveyed on the 10th of June 2015. Kulula JNB to Cape Town : Avoid travelling on the 23rd or 24th where possible, as the public holiday means flights are very expensive. Rather travel on the 8th, 9th or 28th. Kulula Cape Town to JNB : Flight prices are relatively consistent throughout the month, but the cheapest dates to travel on are the 8th and 9th. Kulula Lanseria to CPT : As for JNB to CPT, it's cheapest to fly on the 8th and 9th. Kulula CPT to Lanseria : Where possible avoid travelling on the 27th and 28th and rather travel on the 8th or 9th. Kulula JNB to Durban : Flight prices are very consistent throughout the month, with only two Wednesdays to avoid. Kulula Durban to JNB: Avoid travelling on Sundays and Mondays where possible as those days are slightly more expensive. Kulula Lanseria to Durban : Prices around the public holiday are the most expensive to travel on. Kulula Durban to Lanseria : Avoid travelling on the 27th and 28th where possible, as flights are the most expensive on those dates. Kulula JHB to George : Flight prices are considerably cheaper on the 20th and 27th and avoid the 23rd and 24th where possible. Kulula George to JHB : Flight prices are severly elevated on the 27th and 28th of September. Kulula CPT to Durban : There isn't a big difference between the cheapest and most expensive flight on this route and the cheapest flights are only available on very selected dates. Kulula Durban to CPT : Airfares are higher than usual on the 27th and 27th of September. Kulula JHB to East london : The cheapest fares are evenly spread throughout the month, with the most expensive dates to travel on being around the public holiday. Kulula East London to JHB : Prices are relatively affordable throughout the month, with prices only elevated on the 27th and 28th. 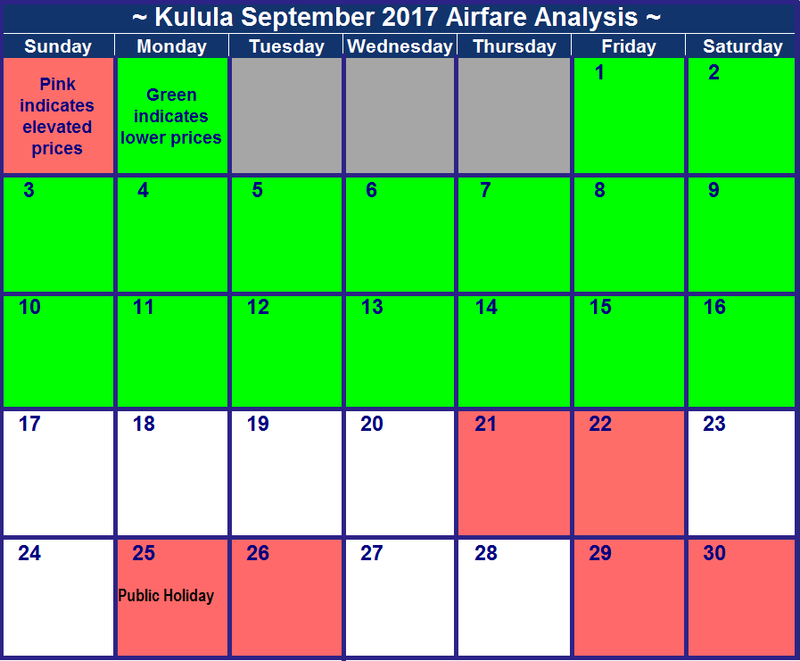 Theoretically speaking, Kulula September 2014 flight prices should be relatively level because of the dearth of holidays. In September 2014 we have only 1 public holiday - Heritage Day (or Braai Day, as some people call it), which falls on the Wednesday, the 24th. So, your options are to turn it into a long weekend by taking leave on the 22nd and 23rd or 25th and 26th. There are also no school holidays beginning or ending in Sep 2014 (school holidays begin on the 4th October). Kulula JNB to Cape Town : As you can see the flight prices are exactly the same on every day of the month, except the 25th when it's a bit cheaper than usual & the 26th when it's a bit more expensive. Kulula Cape Town to JNB : The 25th is also cheaper from CPT to OR Tambo, maybe it's a bit like a Saturday, because of the 24th being a public holiday. Avoid flying on the 28th and 29th of September. Kulula Lanseria to CPT : As for JNB to CPT, it's cheapest to fly on the 25th. Kulula CPT to Lanseria : Cheapest to fly on the 25th. Kulula JNB to Durban : Try not to travel from OR Tambo to Durban on Fridays, as flight prices are elevated. Kulula Durban to JNB: Cheapest airfares are exactly the same on every day of the month! Kulula Lanseria to Durban : As for JNB to DUR, avoid flying from Lanseria to Durban on Fridays (although, to be fare, there's not much in it). Kulula Durban to Lanseria : Airfares are even stevens, so take your pick. Kulula JHB to George : Airfares are slightly elevated on Heritage Day. Kulula George to JHB : Flight prices are slightly elevated on the 21st and 28th of September 2014. Kulula Durban to CPT : Airfares are higher than usual on the 24th, 26th, 27th and 30th of September. Kulula JHB to East london : Cheapest fares are evenly spread over the month. Kulula East London to JHB : As for JNB-ELS, fares are even across September 2014.